Tripp Lite P581-003-V2 DisplayPort 1.2 to DVI Active Adapter Cable, 3 ft. 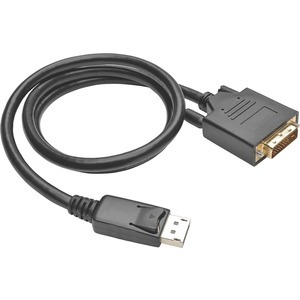 The P581-003-V2 DisplayPort 1.2 to DVI Active Adapter Cable connects a DisplayPort computer to the DVI port on a monitor, projector or television. With a latching DisplayPort male connector on one end and a DVI-D male connector on the other, this cable requires no separate adapter. It lets you use your existing DVI display instead of buying a new DisplayPort monitor. P581-003-V2 DisplayPort 1.2 to DVI Active Adapter Cable, 3 ft.